Use the link below to find train schedules from your closest Long Island Rail Road station to the Stony Brook station. Stony Brook’s LIRR station is on campus and is a ten-fifteen minute walk from the Free University’s hub. After leaving the train, exit the station on the campus side. Walk through the parking lot to Circle Road. 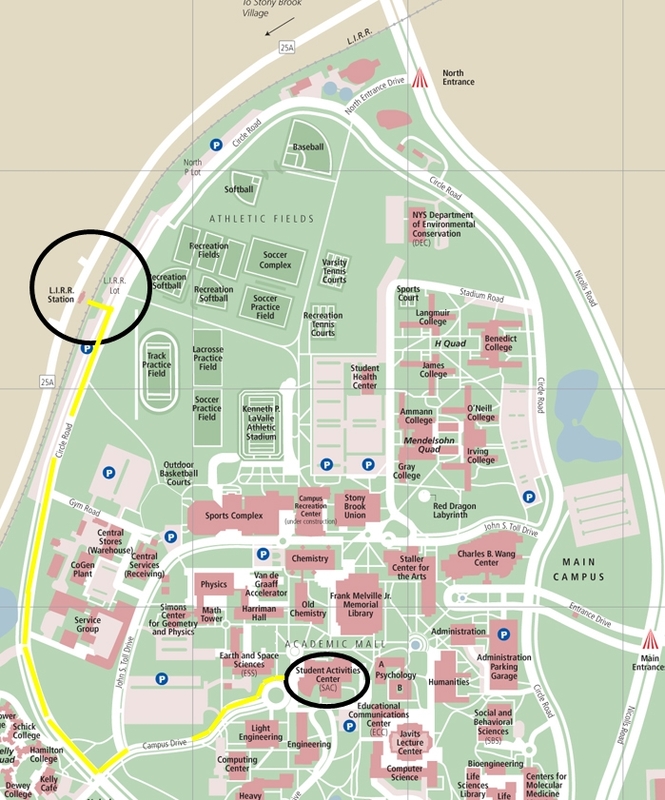 Turn right onto the Circle Road sidewalk and follow the sidewalk until you reach the intersection for Campus Drive. Turn left towards Campus Drive and use the cross walk to safely make your way onto Campus Drive’s sidewalk. Follow this sidewalk until you reach a circle in the road. 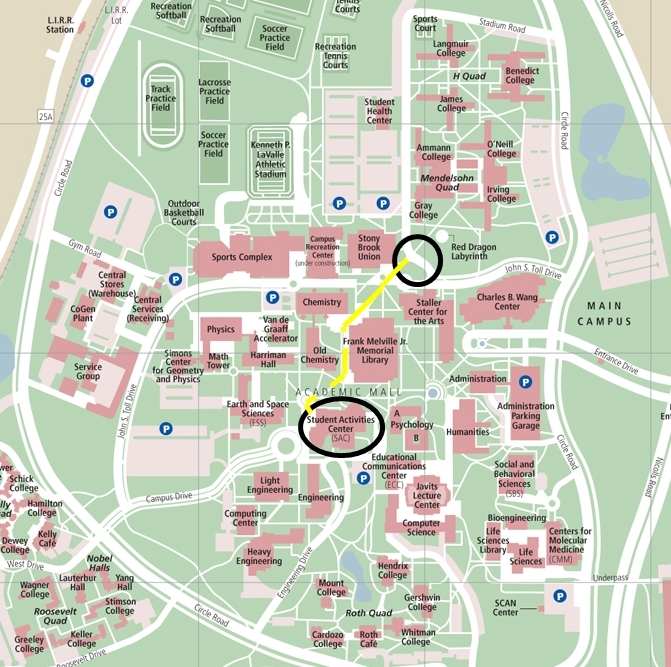 From here you can follow the circle’s sidewalk to your left and you will arrive at the Student Activities Center (SAC). The Free University’s hub will be available either in the plaza near the SAC or in the SAC’s main lobby. The map below highlights the intended path. Bus Information: Below is a link for the S60/69 Suffolk County Transit Bus information. For May Day, the S60 bus will be your best choice. Its information is located on the second page of the PDF. We would recommend that you use the Stony Brook S.U.N.Y. Student Union stop. From this stop you should walk towards the entrance of the Stony Brook Union building. Turn left away from the Union building’s entrance and cross the street. After crossing the street walk towards the Stony Brook Book store which is on the Library’s lower floor. Turn right as you approach the store and follow around the side of the library building. As you follow around you will find yourself on the Zebra Path which inclines towards the academic mall. Once you’ve reached the top of the Zebra Path you will see the Student Activities Center (SAC) directly across the mall from you. Cross through the grassy area to the SAC plaza. The Free University’s hub will be in the plaza or in the main lobby depending on rain. The map below highlights the intended path.